On the south side of the Yarra River in Melbourne, a mile or so from Flinders Street Station, is a large and rather imposing stone building. 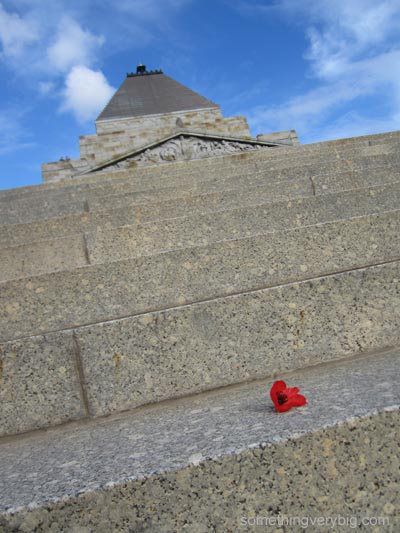 The Shrine of Remembrance sits on slightly elevated ground, with large Doric columns on all sides and a truncated pyramid soaring into the sky. I went for a ride on my bicycle last month, down the Moonee Ponds Creek trail, over the Yarra at Docklands, and along St Kilda Road. I could see the Shrine in the distance. I cycled across and stopped for a visit. Underneath the Shrine is the Crypt – a quiet space with bronze panels on the walls, regimental flags hanging from the ceiling and a sculpture in the middle. Climbing some stairs through the middle of the stone walls of the Shrine, I emerged in the Sanctuary, which is the heart of the memorial. Perhaps it may have felt more sanctuary-like had a busload of tourists not also shown up at that exact moment. It is a space reminiscent of the Hall of Memory at the Australian War Memorial in Canberra, perhaps not surprising given the particular functions of both spaces. In the middle, sunk below floor level, is a slab of marble upon which is the Biblical inscription, ‘GREATER LOVE HATH NO MAN’. On Remembrance Day, November 11, each year, at precisely 1100, a beam of sunlight comes in through a special hole in the roof and falls onto the stone. Marvelling at the effort and calculations that would have been needed to make that little party trick work, I climbed some more stairs up to the Balcony level. It’s not a particularly tall building when compared with the skyscrapers across the river, but it’s still a nice outlook from the top. The view to the east reminded me a little of Greenwich in England. And to the west, a couple of miles away, I could see Albert Park and, beyond it, the bay. A couple of years after the war ended, Fannie Johnston left her “little rose + honeysuckle covered cottage” (A01-114-001) in Dayboro, Queensland, and moved to Melbourne. 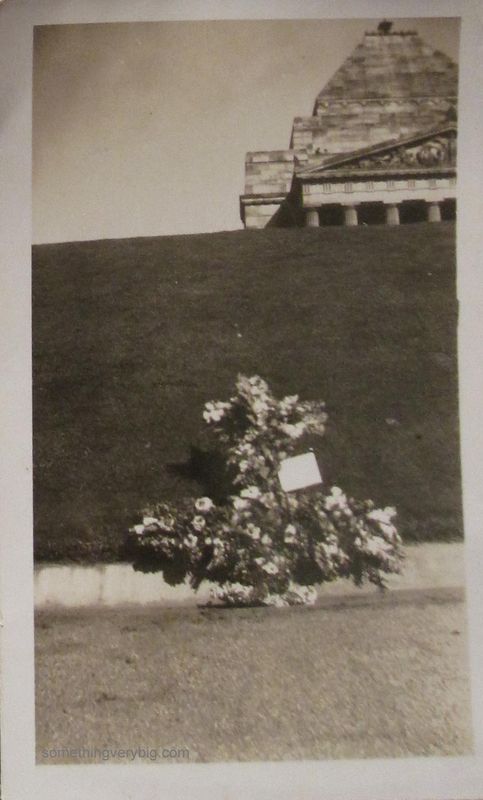 In September 1949 she made the short journey from her new home in Barrett St, Albert Park, to the Shrine of Remembrance. There, she left a large floral arrangement, “in precious memory of Dale and his pals” (A05-184-004). She sent some photographs of the flowers on the steps of the memorial to the families of some of Dale’s crew mates. Copies survive in the collections of Freda Hamer, Gil Thew and Steve Butson. 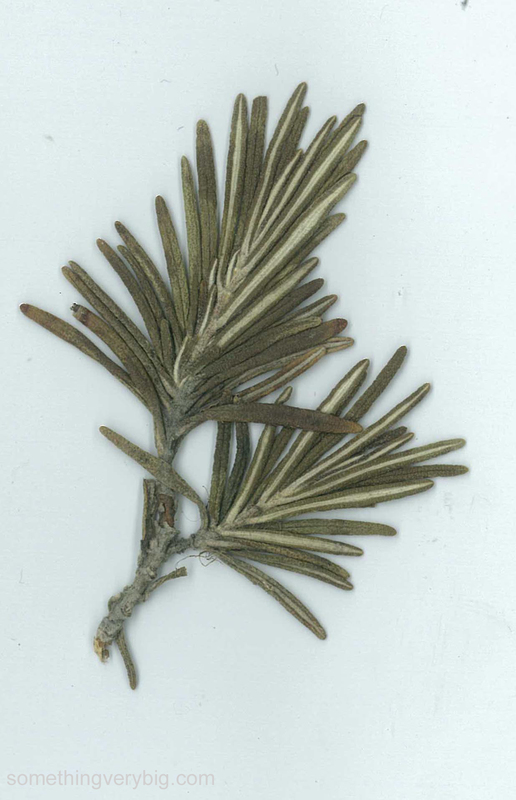 Carefully wrapped up alongside the photos in Gil’s box is a small sprig of pressed rosemary. As I walked back towards my bicycle, I turned and looked back at the Shrine. In my mind’s eye I could see Fannie Johnston placing her large bunch of flowers on the steps. All I had was a small red poppy. That’s beautifully written. What a great way to highlight the stone using natural sunlight.